Turns your computer into an easy-to-use Virtual Film Studio designed for the filmmaker. No drawing, animation or specialized computer skills needed! Think a 3D Storyboarding program will take too much time to learn and use? Think again. FrameForge Previz Studio has been used in the grueling schedules of television production on shows ranging from CSI:Crime Scene Investigation to Downton Abbey, and has been so fast and effective at streamlining their shoots and improving their productions that the National Academy of Arts and Sciences gave us an Emmy® for it. And if it can save those award-winning productions time and money, think what it can do for you. Don't settle for a storyboard solution that only solves the problem of "I can't draw"
When you think about Storyboarding, do you think of it as a creative, inspirational process that you know will help you to identify and preemptively solve problems, one that will save you money and dramatically streamline your shoot, all the while inspiring you to produce your best work? 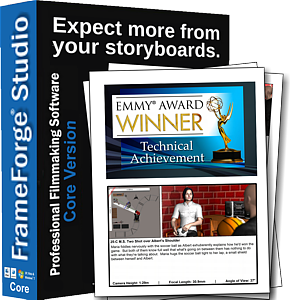 if not, then you need to re-evaluate your storyboarding process, because FrameForge Users do. 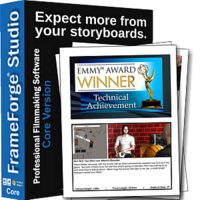 Designed by filmmakers for filmmakers, FrameForge Previz Studio is the award-winning storyboarding solution that uniquely solves the right problem, which isn’t “how can I create storyboards when I can’t draw” but rather “how can I truly best prepare for any film, television, commercial or other filmed project to ensure that my shoots go as smoothly as possible, costs are controlled, creativity is enhanced, and the resulting product is the best it can possibly be.” It manages this by turning your computer into an easy-to-use virtual 3D film studio with optically accurate cameras, all your actors, sets and props, allowing you to literally let you pre-shoot your film before you ever step on set. The benefits of this approach are dramatic in the key areas of creativity, problem-solving, communication, cost-savings and improved final results. Creativity. When you prep your shots in FrameForge's Virtual Film Studio, you're effectively on your set or location with your camera package and the freedom to experiment and explore ideas without the pressure of cast and crew. You’ll start with your idea for a shot just as you would with any other storyboarding process, but you’ll then go so much further, because with FrameForge you can freely experiment with other angles, camera heights, lens choices and blocking in your actual space with optically accurate camera equipment. Just as they say “writing is rewriting,” everyone’s best work comes from taking good initial ideas and then pushing past them to create truly exceptional ones. Problem Solving. Experienced filmmakers know that even though a shot might look good on paper, it doesn’t mean it’s actually possible to shoot. This can be for a host of reasons: unrealistic forced perspective, not enough space to put the camera where it would need to go, undesirable distortion or relative actor sizes due to short lenses, insufficient sense of location due to long ones, and so on. FrameForge is uniquely designed to let you identify and avoid all these potential problems during your pre-production, and not on set. This is a natural result of its process, because when you’re prepping a shot in FrameForge, you’re already effectively on your set or location, using the camera you’ll be shooting with, so you’ll naturally discover what’s involved in getting each shot, and whether your idea is practical. Communication. FrameForge’s approach of a virtual film studio means that when you set up a shot, you aren’t imagining what the camera will see, but are literally setting up the shot. Thus when you talk about it to cast and crew, producers and clients, you have all the information on both what the shot is, and how you intend to shoot it. The wealth of real-world production data this approach produces lets you have conversations with unparalleled clarity, completely avoiding expensive and time-consuming miscommunications, which is why many productions often have the program running in meetings to they can spitball ideas and instantly integrate feedback. Cost-Savings. As every producer knows, time is money. And as every filmmaker knows, there’s never enough of either during your shoot. However, when you prep in FrameForge, you’ll have already identified and solved potential issues that you’d otherwise have to solve on set, saving you all the wasted time usually burned by trying to set up those impossible shots. And since its data-rich storyboards tells everyone not only what each shot is, but also how you plan to shoot it, what the camera will see, which actors and camera equipment (Pro & Stereo Only) are needed for the shot, your shoot will run smoother and faster and the crew will be far more efficient, particularly in getting subsequent shots setup while you’re working on the current one. Shoots prepped in FrameForge routinely report making all their days, and often wrapping early while still getting more coverage than planned because of increased efficiency. Improved Final Results. This is the culmination of all of the previous benefits. The opportunities for increased creativity in your shot choices ensures you won’t have just shot your first idea, but will have worked and improved your vision going into the project. The increased efficiency of the shoot not only gave you more time for retakes, additional coverage and the like, but also, because everyone knows what’s planned without any ambiguity or miscommunication, each department had more time to do what they do best, rather than spend it in constant consultations with each other. The director had more time with the actors, the DP had more time to ensure the shot look its best, the gaffers knew what the camera will see so they could more efficiently and independently design the best lighting plans and so on. Still sound too good to be true? Listen one of our users speak for themselves! Ryan Connelly Film Riot "I really love using [FrameForge] because you can experiment with shots before you ever get on set, and I actually realized that my plan for the opening scene wasn't going to work by doing my storyboards this way." HumanTouch™ Tweening - This new feature adds a subtle but substantive acceleration and deceleration to actor's tweened movement to make them look more natural and less robotic. Camera Targets - Drop in a camera target on set and it will lock the current camera to keep that target in the same place in the frame, regardless as to where the camera moves. All New Posing Controls - Pose your actors faster and easier than ever before. Improved on-set Access to all Object Hinges - Quickly pop up all the available hinges for an object making it faster and easier to get them into the position you want. New Auto-Sizing Floors and Ceilings - You can now give any room its own floor or ceiling, automatically shaped to that room. Larger Working Areas–as long as you have a decent graphics card, the program can now use all of the available space for the live view and live blueprint view often giving you nearly 30% more working space! New optically reflective mirrored objects — Version 3.6 now renders optically accurate reflections in mirrors, allowing you to truly plan shots involving mirrors. Automatic Room Layout Adjustments when resizing Rooms means that you when you resize a room with furniture in it, all the furniture will automatically adjust to maintain their relative positions in the room. 30 New and Improved Facial Expressions and Facial Modifiers let you create even more drama and impact in your scenes with expressions such as Concern, Pout, Smells Bad, Kiss and Stubborn along with facial modifiers such as Cheeks Puffed Out, Epicanthic Fold, and Eyebrows Tented along with a revised Expression Editor for easier access to exactly what you want. And loads of interface, object and speed enhancements to make your storyboarding faster and easier, and the give the resulting images even more impact than ever before! Real-World Camera Equipment and Peripherals - Each camera features full Pan/Tilt, Dolly, Zoom, Roll and Crane control with the options to limit focal length to a specific zoom range or set of prime lenses, limit minimum and maximum heights (due to equipment limitations or physical ceilings) to accurately portray the actual range of equipment. Light & Shadows - An innovative Lighting Mixer allows the creation of a core lighting plan, while Multiple-source overlapping shadows add depth and realism to any image. Sets & Actors - The searchable drag'n'drop library includes well over 1,000 World-Ready™ objects, from interiors and exteriors to 76 fully posable actors all of whom can be personalized with age, ethnicity, hairstyle, textured clothing and body morphs. Script Synching - Import your formatted screenplay from all major script formatters and word processors to generate sets and associate your shots with text in the script on a line-by-line basis. Animation - Advanced Animation and Animatics with Automatic Tweening and direct export to QuickTime, AVI and SWF Movies/Animatics. Google® SketchUp® File Importing - Opens up all of Google Warehouse to use with FrameForge Previz Studio's Importing Wizard, so the entire sketchup file becomes a single FrameForge prop or set.